This pork dish includes potatoes and carrots. 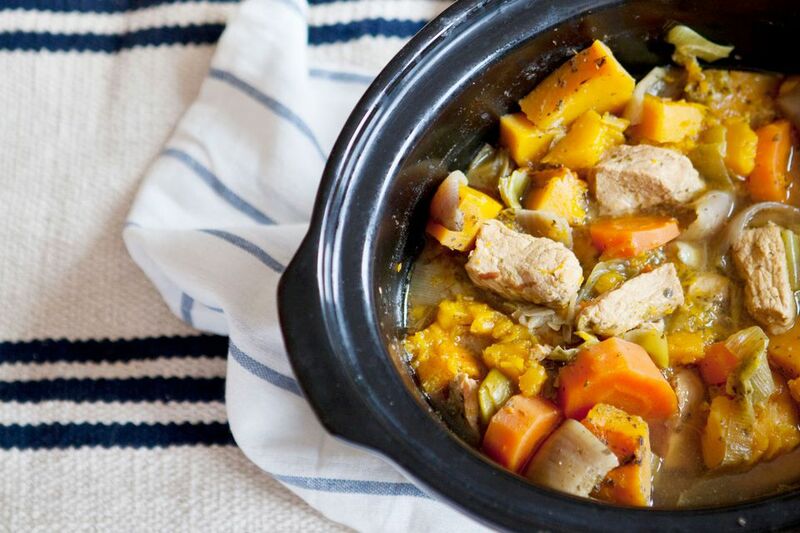 The pork and vegetables are layered in the Crock-Pot and slow cooked to perfection. Trim visible fat from pork. Toss the pork cubes with flour to coat well. Combine salt, thyme, crushed coriander seed, and pepper; reserve. Drain liquid from beans into a 2-cup measuring cup; add boiling water to make 1-1/2-cups. If you'd like, you can use chicken broth instead of water. Layer vegetables and pork pieces in the slow cooker in the following order, sprinkling each layer with the seasoning mixture: half of each of the potatoes, onions, pork, beans, and carrots. Repeat with remaining vegetables, pork and seasoning mixture for a second layer. Pour liquid over; dot with butter. Cover and cook on low for 8 hours or high for 4 hours or until meat and vegetables are tender.